I'm so excited to share how the nursery turned out! It's my favorite room in the house! I wanted a gender neutral nursery with a bold pattern that was calming for a baby but could transform into a fun playroom for when she gets older! I have to throw it back first to what i started with when the room was an office...because i LOVED my shelves and they deserve one last photo. Before i get into the details i want to say thank you to all of the amazing small businesses that sent items for our little girl! Everything is so beautiful and unique and i'm sure will be very special to her! Here we go! First things first. I am completely IN LOVE with the wall!! I've gotten hundreds of questions asking where the "wallpaper" is from and i'm very happy to tell you that it's actually a stencil! I think stenciling is SO much easier than applying wallpaper and you have more flexibility with the placement of the pattern and of course endless color options! I posted on instagram stories when i was stenciling the wall and someone responded "loving the Andes Mountain theme!" and it totally MADE my life. Get the stencil here. 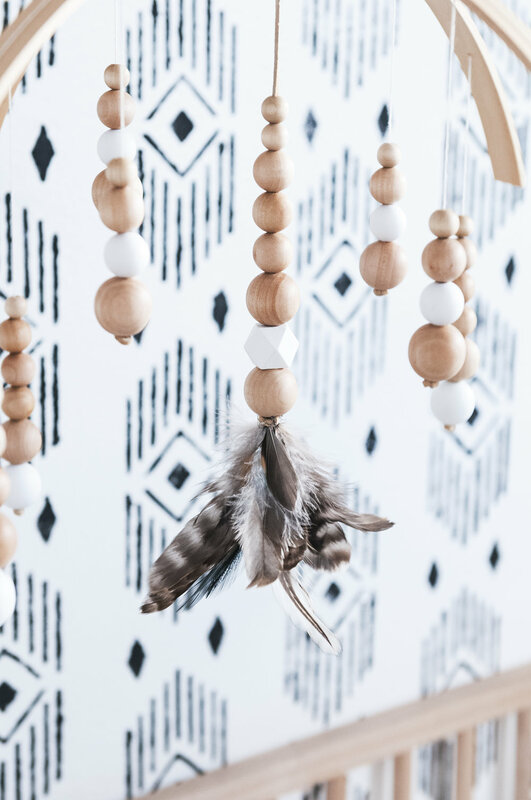 The wood mobile is handmade and has real owl feathers at the end. It is SO beautiful and compliments the crib perfectly. There are many styles and colors to choose from if you want to order your own! The adorable black and white stuffed animals in the crib are from Imani Collective and were handmade in Kenya! I love them so much! Imani Collective has the sweetest, most beautiful handmade products! You guys have to check them out! The dresser was a simple DIY! I had my eye on a dresser from West Elm but couldn't justify the $700 price. Ikea has a similarly shaped dresser for MUCH cheaper so i just painted it and changed the knobs and i think it looks amazing! The cute alphabet print is from Mini Learners and the cute wooden Scandinavian toys on the shelves and dresser are from Gold Rabbit and Co and Sarah and Bendrix. I love how simple they are! The chair is a modern take on the womb chair and is so comfortable and cozy! I also got the coordinating ottoman! I wanted a chair that could easily move to the living room later which is why i didn't go for a standard rocking chair. The cute little cat doll is from Sarah and Bendrix. I love how it turned out and can't believe there will be a real baby there in just a few weeks! Hope you enjoyed it! I sure loved putting it together!